We have all heard the saying that a person’s age is nothing but a number. In many instances this is true, however, when it comes to getting pregnant and having a healthy pregnancy, age can and does matter. It is reassuring to know that many healthy women who get pregnant after age 35 – and even into their 40s – have healthy babies. In order to maximise your chance of being one of these people, you should be taking action now, so that you can be at the top of your game when it comes to your health and your baby’s health during pregnancy. It is commonly known that female age does impact upon your ability to fall pregnant, especially after the age of 35, as this is the time when female fertility undergoes a significant decline. Start Trying To Become Pregnant Now! If you are a female and 35 years of age or older and what to have a baby – now is the time to start trying. The longer you leave it, the harder it can become. If you have been trying for 6 months without success then it’s time to see a fertility specialist who can perform specific investigations and provide you with an appropriate fertility treatment plan if required. Not many people realise that approximately 90% of female eggs are abnormal by the age of 40 so its vitally important that you try to conceive before this time to maximise your chance of a healthy pregnancy and baby. Diet: Whether you are trying to conceive or not, a healthy diet is imperative. The best approach is not to do a crash diet or use meal replacements, but rather look at portion control as depicted in the diagram below. 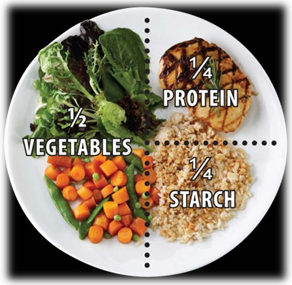 Using the portion control approach is easy – all you need to do is divide your plate into three sections: ½ of the plate is allocated to fruit and veggies, ¼ allocated to lean proteins and the final ¼ to grains and starches. Half of your plate is filled with non-starchy vegetables such as green beans, tossed salad or carrots. A quarter of your plate is filled with lean protein such as skinless chicken, non-fried fish, tofu or lean cuts of beef or pork. The final quarter of your plate is filled with whole grains or starchy vegetables such as whole wheat bread, pasta, rice, corn, peas or potatoes. Check out our fertility diet tips video for further information. There is now very strong evidence that being either underweight or overweight impacts on the chances of IVF treatment being successful (and on the chance of pregnancy without treatment). In addition, once pregnant, there are extra risks to the baby if a woman is underweight or overweight. We strongly advise all women (and the men also need to set a good example here!) to get to and stay at a healthy weight before, during, and after successful treatment. There is no magic pill that will make you shed the weight. Good old fashioned exercise and attention to a good quality diet are the keys to success. There are many paths to weight control – think about what you think will suit your personality type. You might find the support of a group like Weight Watchers helps you, or prefer the individualized help of a dietician or personal trainer. Don’t make any excuses – PREGNANCY IS your excuse to get your weight under control for good! Exercise: No surprises here either! We all know we need to do this, don’t we? Daily exercise, at least 30 minutes at a time, assists in weight control, fitness and general health. It doesn’t really matter what form of exercise you do, so long as it works for you. It is possible to overdo it though. More than an hour of hard exercise each day is probably excessive. Take prenatal vitamins. All women of childbearing age should take a daily prenatal vitamin containing at least 400 micrograms of folic acid. Getting enough folic acid every day before and during the first 3 months of pregnancy can help prevent defects involving a baby’s brain and spinal cord – these are known as neural tube defects. Taking extra folic acid adds an additional level of protection for older women, who have a higher risk of having a baby with birth defects. Some prenatal vitamins have 800-1,000 mcg of folic acid. This is still safe in pregnancy. As a matter of fact, some women need more than 400 mcg for protection against birth defects, if you are unsure of your needs talk with your GP. Get early and regular prenatal care. The first 8 weeks of your pregnancy are very important to your baby’s development. Considering many women do not know that they are pregnant for a few weeks, accessing early and regular prenatal care is vitally important, as it can help increase your chances of having a safe pregnancy and a healthy baby. If you are over the age of 35, accessing prenatal care as early as possible also helps provide extra protection for you and your unborn baby. It allows the doctor to stay ahead of health conditions that are more common in women who are older when they get pregnant. For instance, pregnant women over the age of 35 have an increased risk for gestational diabetes (diabetes that develops on pregnancy) and preeclampsia, a condition only found during pregnancy that manifests as high blood pressure, along with protein in the urine. During prenatal visits, your doctor will check your blood pressure, test your urine for protein and sugar, and test your blood glucose levels. That way, any potential problems can be identified and treated early. Consider optional prenatal tests for women over 35. Your doctor may offer you special prenatal tests that are particularly applicable for older mums. These tests help determine the risk of having a baby with a birth defect and include chorionic villus sampling, amniocentesis, comprehensive ultrasound scan assessment of the baby, and very specific blood tests. Ask your doctor about these tests so you can understand the risks and benefits of having them and be able to make an informed decision as to what’s right for you. At Fertility Solutions, we offer a full range of fertility treatment programs and we offer a free consultation, so that you can understand your options and get your questions answered. Please call us on 1300 337 845 (1300 FERTILITY) to get started.